You may be operating on a budget but you still need to let customers know your business exists. So what’s the solution? Networking, marketing, promotion… You know the usual stuff. And if you are prepared to invest time in a longer term strategy, here are five hard to ignore reasons why you should consider adding a blog to your repertoire. Google rankings will influence your business’s on-line presence. Make an appearance on the first page for your niche keywords and inbound traffic numbers will soar. That’s because Google wants searchers to have a good on-line experience and find what they want quickly. Therefore Google ranks sites with quality content for particular keywords higher, placing them further up the list. They keep your website fresh in comparison to a static website with tired, dated content. Each blog post is indexed giving you more opportunity to be ranked for particular keywords. Blogging ensures there’s always current content on your website meaning readers will be motivated to check in more frequently. What’s more if you post high quality blogs, your content could reach a new audience through social media sharing. So you see blogs help drive traffic to your website too. Blogging is a fantastic way to grow your reputation as an authority in your niche. If you write good quality articles that answer your readers commonly asked questions, you will show up when they search. However to be seen as an authority, what you post is more important than the quantity you post. Put simply you must ensure what you publish is useful, interesting or newsworthy. So write some insider tips or helpful advice; comment on what’s topical in your industry, or keep customers informed with trends in the sector. But beware – post after post of hard sell or banging on about how great your company is just won’t work. Similarly push out keyword stuffed rubbish and instead you’ll alienate customers and drive them elsewhere. OK, blogging isn’t going to transform your sales figures overnight. For your blog to grow in popularity you need to invest time to nurture and promote it. Work out what your readers want to read. Add value by writing quality content. Show up regularly and reliably and over time you could recruit an army of loyal followers who will put you on their short list when they if they need your product. Blogging is unlikely to get a quick sell. Instead it keeps customers “parked” until they are ready to buy. Blogging is an investment in “reminder advertising”. That said don’t be afraid to use your blog to promote your products, services or special offers. As long as the majority of your blogs are worth the read, your blog community won’t mind receiving the occasional sales pitch from you. 5. Blogs are a great opportunity to build in-bound links. People can access your website from a different route meaning you attract more visitors. Google sees good in-bound links as a sign your website is relevant and high quality (good for rankings). If other people link to you, your reputation as an authority will increase. Blogs are a great way to encourage other websites to create an in-bound link to your website. Post valuable content, others reference it suddenly you have a whole new wave of followers clicking your way. Blogging is a great strategy to build your business but only if you do it properly. If you don’t have the time and energy to make your blog good, it’s probably better not to bother. Beware! Google will actually downgrade sites whose content is poor or repetitive. So randomly churning out any old rubbish, even if it does contain your keywords is not going to score you any favours in the Google ratings battle. Instead you need to take the time to determine a clear strategy and ensure your posts add value to your readers. This means making your posts relevant, perhaps unique, informative, humorous, interesting etc. And to achieve this you need to commit time and energy. 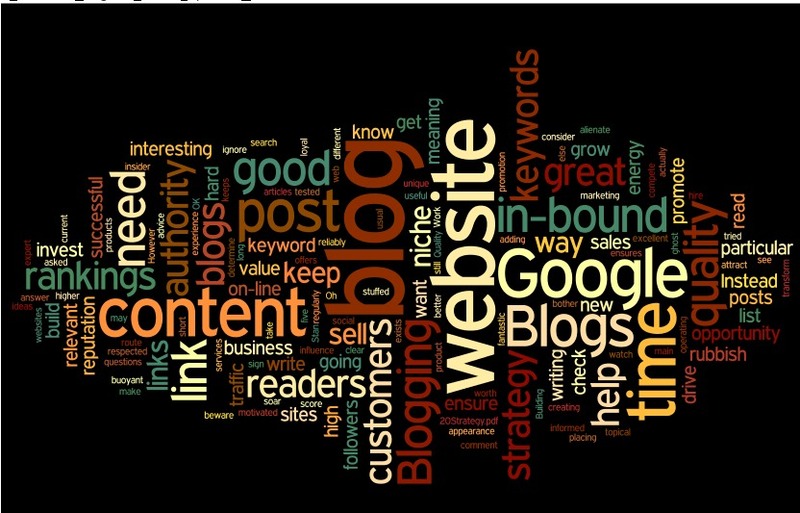 Oh, and watch out for an upcoming blog which will outline some tried and tested strategies for successful blog writing.